Sadly, I have just learned that SAP have displaced one of the best PowerBuilder evangelist resources that I have personally known since PB creator David Litwack introduced me to the first evangelist at PowerSoft - Bill Rabkin. Apparently, this comes on the heels of SAP shuttering the complete Denver office along with many other once Sybase resources. Dave Fish had over 29 years of experience in software development, and over 16 years of experience working for Sybase and SAP. He began using PowerBuilder in 1993 and after joining Sybase held roles as a Professional Services consultant and as a PowerBuilder Evangelist. For the past four years he has been primarily focusing on mobile and web technology. Dave also ran a PowerBuilder blog based website with a plethora of information on the PowerBuilder product (click here). Dave was also well published in the ISUG Technical Journal and the PowerBuilder Developers Journal. One of Dave's best articles that I liked was on the future of PowerBuilder (click here). Dave is now an independent consultant, and is advising clients on mobile application and platform implementations. Dave also recently joined the ISUG-Tech Board of Directors as well. Dave significantly contributed to the continued prowess of the PowerBuilder product over the past decade and deserves - IMHO - accolades for his outstanding work! I think that Bill Rabkin (the founding father of PB Evangelism) would join me in saying that we (the PB community) appreciate your efforts on our behalf. Your exit from the PowerBuilder product scene is certainly going to be a loss for the entire PB ecosystem! Dave ... we (the real PB developers) salute you! Airman goes Mobile with Flair! The Airman system created by Greg Winfield of Volairus has been embraced by many airports around North America and Australia. Volairus Management Systems Inc (formerly known as Winfield Solutions) is a Canadian company that has provided Safety Management Software to airports since 1999. Their software (AIRMAN) is used by professionals throughout North America and beyond to effectively manage everyday activities from Runway Inspections to Wildlife Control, as well as advanced tasks such as managing Corrective Actions to Equipment Maintenance to Work Orders. All this data is then available for comprehensive reporting and querying. A must for effective SMS and SeMS management. Airman also had a mobile offering (known as Airman Mobile) on the PocketPC devices using Sybase's PocketBuilder application development software. However, with the demise of the PocketPC O/S and devices - Greg needed a new way to deliver mobile. In recent years, airports also started to embrace web technologies which opened the door for delivering the current native MS-Windows application (written as a client/server application using PowerBuilder) as a web browser enabled system. Recently, Greg is also exploring cloud technologies as well to allow Airman to be accessible from smaller airports have little or no IT infrastructure. Coming to the Airman rescue was Appeon Web and Appeon Mobile technologies. With Appeon Web, Greg was able to not only able to webify the Airman application but also enable the system on the Amazon cloud as well (for more information on this click here). However, Greg''s latest venture is also moving the Airman application onto the mobile devices as well. This platform is not only supported by Appeon Mobile, but the Appeon product also allows you to access the tablet or smartphone's low level device features like: camera, recorder, GPS, O/S, etc. For Greg, the prize here for the Airman application would be the GPS features allowing the Airman application to know where it is at all times. Greg was able to use initial coding examples from Software Tool & Die (STD ) who have a great mobile device example and framework for Appeon on the SourceForge website. The latest example application for Appeon 2013R2 also included a new demonstration of the Appeon mapping object which allows you to visualize where you are based on the devices GPS data! Greg was able to take the STD example code for using the GPS and Mapping CVUO (custom visual user object) and add these features to the Airman application recently. However, he then needed to test this feature in the field ... that is a real airport. 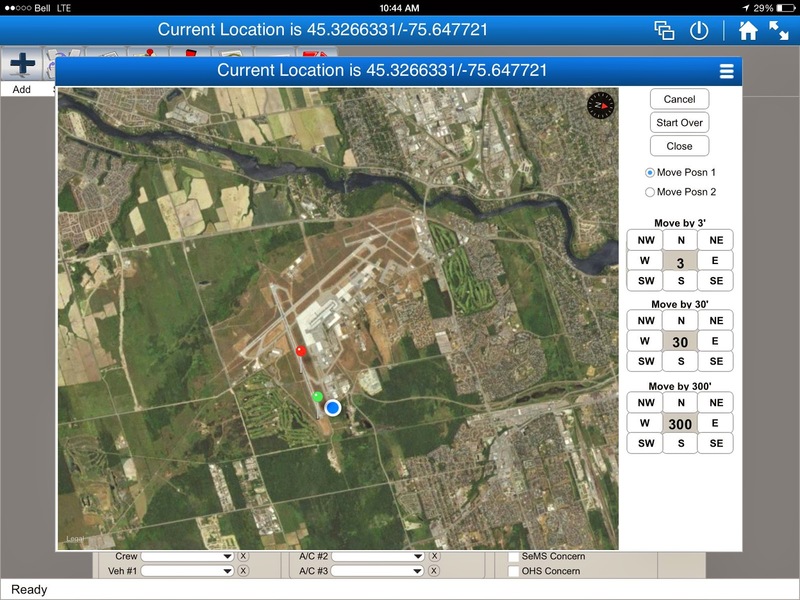 Since Greg lives not too far away from me here in Ottawa, Canada - he decided to field test the Airman GPS/Map enabled version at the Ottawa International Airport. The other bonus as well was that Greg could publish the updated Airman application to the Amazon Cloud and then access this latest version on his 3/4G enabled iPad. Greg Winfield testing the Appeon enabled Airman (Ottawa airport)! In the field, Greg could then launch the Airman application from any location that had a wireless signal. Once started, the Airman application on the iPad could access the device's on board GPS navigation sub-system to find out where Greg was using the device. In this test case, Greg was standing at the base of the main runway where that day, the airplanes were taking off from. The GPS correctly informed the Airman application exactly where Greg was standing! Actual Airman Mobile iPad screen capture of the Ottawa airport. 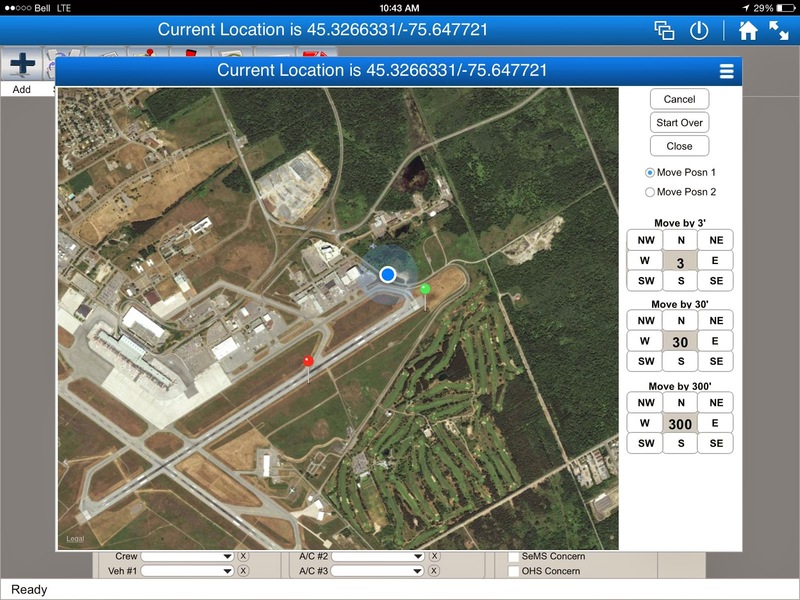 On the iPad itself, not only was Airman able to give Greg the co-ordinates, it was also able to confirm visually that the user was at the Ottawa airport and then provide an aerial view of the airport and its runway system. This type of visual interaction with the Airman Mobile application is paramount when dealing with system users that need to visually orient themselves as to where they are around the airport or relevant to a key structure like the airport tower for example. Actual position of Greg (blue) and two annotations (green + red). The next great feature of the Appeon mapping object is the ability to interact with it to add an annotation to the current map using the "of_addAnnotation ( )" method. For the Airman system, this enables the user to drop a "pin" on the map and move it to a location that the user wants to document (for example a fuel spill, airplane, etc). The Appeon Map object provides the PowerBuilder developer with other methods as well to get the current address of the annotation, select one or more annotations on the map, etc. With these powerful commands, the Appeon Mobile enabled application can readily visually convey various pieces of information to the Airman user. Of course, Appeon Mobile also supports Android based O/S devices - so these type of GPS and Mapping features can also be utilized on DROID based devices as well. This allows the Airman Mobile application to offer any airport their choice of mobile devices to run the application system on! For more information on the Airman application, please visit the website! 2014 Appeon World Tour Continues! Appeon hosts global conferences for customers, Appeon Business Partners, and industry experts to share best practices, explore new technologies and network with business and technical decision-makers. Join us at one or more of our global events, offered in multiple locations year-round. Appeon looks forward to seeing you at a Appeon World Tour event. For any questions and updates related to the Appeon world tour, please contact us at: ibd@appeon.com. On Oct 7-8, Appeon and our local partner will host a two-day seminar in Milan, and it is now open for registration. Join us there, be the first one to experience the latest version of Appeon and get advanced Mobile training.